The Tactus label has established its name with a strong line in Italian composers, giving special attention to a number of neglected Baroque composers. They include Alessandro Besozzi (TC 700202), Giovanni Battista Martini (TC 701301), Angelo Berardi (TC 630201), and the Italian-Argentine Domenico Zipoli. 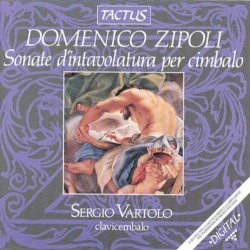 Naples-born Zipoli’s music for organ (TC 682601) has not come my way, but this disc of his harpsichord works has been a very welcome find. In a fair world, this recording should make him widely known to music lovers, and even be a Tactus bestseller. Still, Zipoli is overlooked by musical dictionaries that date back even five years — despite some recent releases on K617 and Hyperion (See a Music Web International (MWI) review of his Vespers of St Ignacio, on K617). Zipoli took music lessons from Scarlatti père — but fled maestro Alessandro, apparently for being a horrendous teacher! He then studied under Bernardo Pasquini in Rome, before becoming a Jesuit in 1716. So say the Tactus notes, as well as that he travelled with the order to Buenos Aires in 1717, dying of tuberculosis in Argentina’s second city, Córdoba, in 1726. Other sources ( MWI again) claim he was banished from Rome for having “relations” with an aristocratic benefactress, and spent years in Seville waiting to be shipped to Paraguay (akin to being shipped to Switzerland) — dying in Argentina before taking holy orders. Be that as it may, music was apparently integral to the Jesuits’ evangelizing, and Zipoli’s music successfully hustled the faithful into their flocks. Unfortunately, precious little survives of his later works, whereas this solo harpsichord collection is from the year before he left Europe. John Walsh, Handel’s publisher, released an edition in England a few years after their composition, suggesting attention from very worthy contemporaries. This collection is divided into four Canzonas, or suites of movements, and two Partitas. All are rich in musical ideas, often brimming with charm and felicity. A certain breeziness in Sergio Vartolo’s playing of the rapid movements infuses them with a seeming spontaneity and expansiveness. His phrasing in the less energetic passages is often carefully nuanced to bring out their delicacy. Intriguingly long melodic elaborations are frequent; among other pieces, this disc’s lengthy closing Partita is particularly seductive. Alberto Ginastera composed an arrangement for organ of a Zipoli Toccata (on Naxos) decades ago, but my guess is that some day these inventive suites may be chosen for performance by pianists, or perhaps certain movements will be heard as encores. This will appeal to anyone with an ear for the period, or who craves well-elaborated music out of the mainstream. These works belong to a time when the language of sonatas, sinfonias, and canzonas was in flux, and when keyboards were in the early days of being explored for their possibilities as solo instruments. Even so, Zipoli’s work reveals occasional flashes of flamboyance. The booklet to this collection reproduces the frontispiece for the original edition. This is housed in Bologna’s Museo della Musica alongside “thousands of other treasures.” What music as fine as Zipoli’s, one wonders, remains to be unearthed by Bologna’s enterprising Tactus label?